It's just another day when they are after a bounty on Mars, when a strange event unfolds. After a devastating explosion on a highway an unknown disease begins to spread among the people. The situation gets really disastrous when the disease claims over 500 victims. As the local government sets the highest bounty ever in the history on the head of the culprit it's time for Spike and friends to enter the action. This movie takes place between episodes 22 and 23 of the TV series. Based on a Osamu Tezuka's graphic novel first published in 1949 more than 10 years before the inception of Tetsuwan Atom (Astro Boy), Metropolis takes a look at the rapid expansion of science and technology and the co-existence of humans and robots. Set in the future, Metropolis is a grand city-state populated by humans and robots, the cohabitants of a strictly segmented society. Amidst the chaos created by anti-robot factions, detective Shunsaku Ban and his sidekick Ken-ichi are searching for rebel scientist Dr. Laughton. But when they locate him, his secret laboratory is destroyed by fire under sinister circumstances, and instead Ken-ichi finds Tima, a beautiful young girl bereft of memory and speech, seemingly helpless at the site. Little does he know that Tima is a new top-of the-line android created to take over Metropolis, and that behind her creation lie the ambitions of a powerful man and his fierce desire to reclaim a tragic figure from his past. 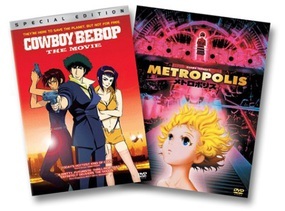 DVD Features: Widescreen and Full Screen presentations, Animax Special: The Making of Osamu Tezuka's Metropolis, Interview with Rintaro Katsushiro, Two Animation Comparisons, History of the Metropolis Comic Book, Digitally mastered audio & anamorphic video, Theatrical Trailers, Biography of Osamu Tezuka, Production Notes. Spoken Languages: Japanese DTS and 5.1 Dolby Digital, English 5.1 Dolby Digital, French. Subtitles: English, French and Spanish subtitles.